The historic McDougall Memorial United Church is located a short drive west from Calgary. In summer, I love to enjoy these country roads on my motorcycle and avoid the busy highway on my way to Canmore, Banff or beyond. Built in 1875, this church southern Alberta’s oldest surviving Protestant church and the oldest remaining structure in the Bow Valley. It was once a part of Morleyville, the oldest pioneer settlement in southern Alberta and home to its first herd of breeding cattle. The church was founded by Methodist missionary George McDougall and his sons John and David. The old church is now a provincial historic site. The site was originally called Ghost River, but he renamed it Morleyville in honour of his friend Morley Punshon, a doctor from Ontario. John McDougall and his wife began their work by constructing a two room log shack with a sod roof for themselves and a small church. David McDougall later joined his brother John at Morleyville and helped to found the Indian Trading Post. In its early days, about seven hundred First Nations visited the post to barter animal skins for food, blankets, stockings, and other supplies. The outpost became a hub for settlers coming into the Bow Valley and reached a population of over two hundred at its peak. George got lost and died in a blizzard while on a buffalo hunt – just a few miles from home, near what we now know as Calgary, Alberta. 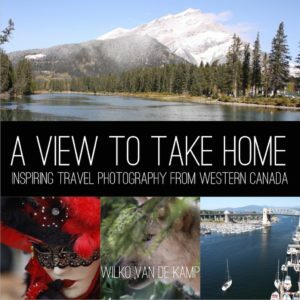 Travel along with professional photographic artist Wilko van de Kamp as he chronicles the awe-inspiring beauty of Western Canadian provinces Alberta and British Columbia in his book “A View to Take Home”. Wilko captures the different aspects of the life he found when he explored these provinces as a “fresh off the boat” immigrant from Europe. He brings his findings in stunning, high-resolution images directly to the reader. Flipping through the pages of A View to Take Home, readers will feel as if they are riding alongside Wilko as he explores his newly adopted homeland on his motorcycle.